« THE WORLD’S WORST SUPERHERO TEAM. It was at last year’s WonderCon that I attended Mike Mignola’s panel on the future of the Hellboy Universe, at which time he announced the big news that Hellboy In Hell was coming, and the fact that he would again be gracing his accolades with his long overdue return to drawing. I am one of the aforementioned who was immediately launched into orbit at the very prospect of his return. Yet, as if that wasn’t enough, my appetite was whet even more so by the announcement that he had finally figured out how he was going to handle Vampires in the Hellboy universe, and in the coming year, we would be treated to it. We’ve had tiny morsels over the years, but never has he really launched into the overly interpreted and, sadly, often excessively indulged, world of the vampire. What initially sounded like having cold feet, because as he put it, … I love vampires, but I don’t want to eff ‘em up! Turned into a period of frustrating stagnancy. Picking right up after the events in B.P.R.D. : 1948, agent Anders is out for blood, Vampire blood, particularly from Hecate herself, not to mention her entire clan, and if Anders has his way, possibly every last damned vampire on the planet. 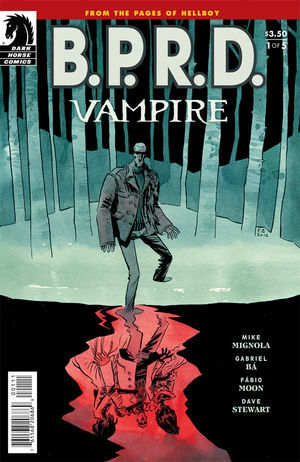 A moody and hugely dramatic start to the series, what really stands out here is the art of Gabriel Bá and Fábio Moon. From the opening splash, the art equates a sense of elegant euphoric horror. A hand, suspended in darkness, laced with traces of languid, liquid crimson—Ominously ethereal. What follows is a series of pages that pull you in, and without any dialogue or captions, engulf you in the tormented emptiness of the undead. A subdued insatiable hunger, that is soon juxtaposed to Agent Anders own hunger to quell his nightmares. In a short flashback, we are treated, once again, to the appearance of Professor Bruttenholm, who tries to dissuade Anders from his revengeful quest, but in the end accedes, and the inevitable result will inevitably be the next 4 issues—Plus. Anders is quickly becoming a B.P.R.D. staple, earning a place right next to Abe, Liz, or Corrigan. Whether it’s his tortured soul, due to his vampire curse, or the conflict brewing between him and Hellboy (which is alluded to here on page 15), it remains to be seen if Anders has a long future in the pages of the Bureau, or an epic end. If you’re like me, you’re dying to find out. As Mignola promised, rest assured, vampires are alive and well in the Hellboy universe, and with such a strong start in the latest installment of B.P.R.D., it appears that their presence will be felt for years to come. This entry was posted in Columns and tagged 1948, bprd vampire, DARK HORSE COMICS, Fábio Moon, Gabriel Bá, hellboy, Mike Mignola. Bookmark the permalink. Follow any comments here with the RSS feed for this post. Post a comment or leave a trackback: Trackback URL.